The first Mass celebrated in Keighley after the Reformation was offered by Fr. Burgess of Myddleton Lodge, at the house of Mr Jack Carr in 1823. Fr. Hampson, a Benedictine, set up a permanent mission in 1835 and became the first resident priest in Keighley since the Reformation. Mass at this time was celebrated in an upper room in Queen Street opposite the Queen Street Arms. The quest was on to find land on which to build a permanent church. Eventually half and acre of land was bought from the Duke of Devonshire. Augustus Welby Pugin was asked to draw up plans for a church in the Gothic style and Saint Anne's Church was built. In time Pugin's church proved to be too small so in 1907 an extension was formally opened which almost doubled the church's length but it was necessary to turn the church round by setting the main altar and sanctuary at the opposite end of the church to the original sanctuary, the site of which became the main entrance or narthex. On entering the church to the left is the statue of St. Anthony and then further down the nave are two large statues of St. Patrick and St. Joseph. On the the right wall of the nave there is a copy of the icon of Our Lady of Czestochowa, also known as the Black Madonna, a treasure of our Polish community. Past the confessionals is the original altar of the church with the Pieta set in the front and above the picture of Our Lady of Perpetual Succour, the patroness of the diocese of Leeds. In 1915 a new high altar and reredos was built. The reredos has two large mosaic panels showing Moses and the Israelites as they are fed with manna (Exodus 16) and the Institution of the Eucharist at the Last Supper (Matthew 26:26-29). In the niches are large statues of St. Peter and St. Paul with four smaller statues of St. Augustine of Canterbury, St. Thomas Aquinas, St. William of York and St. John the Evangelist. Set in the front of the altar are three mosaic panels, showing Isaiah, St. John the Baptist and Melchisedech. The chapel of Our Lady is on the left of the sanctuary and to the right of the sanctuary is the Sacred Heart chapel and further to the right is the statue of St. Anne our patron who, as always, is depicted with her daughter the Blessed Virgin Mary. During its history the Parish has welcomed not only the Irish immigrants but later on the Italians, Poles, Slovenians, Ukrainians, Hungarians, Latvians, Czechoslovakians, people from many African countries and most recently Indians from Kerela as well as many migrant workers from Eastern Europe. 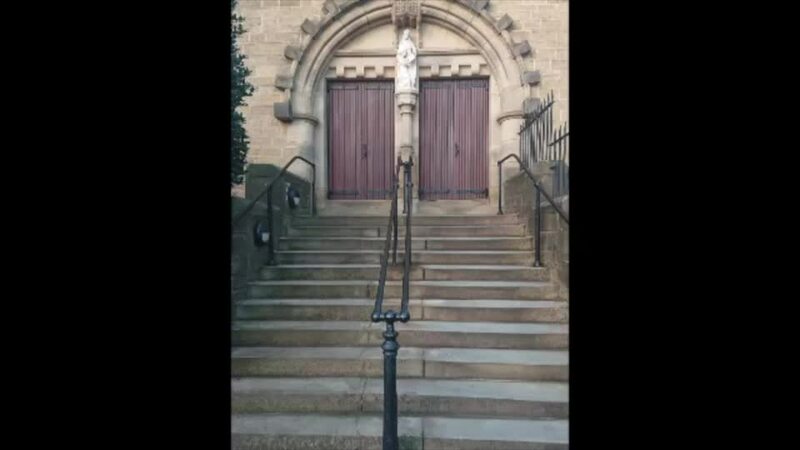 The work of the church always faces new challenges in the proclamation of the faith in September 2016 the newly formed parish of Our Lady of Victories and St. Anne was established; this new parish was created with the amalgamation of St. Anne’s Parish and the Parish of Our Lady Of Victories Keighley. © 2019 St Anne's Catholic Church.